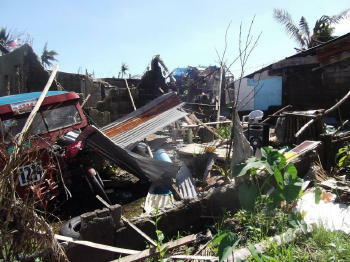 The city of Tacloban in the Philippines has had its share of notoriety and sorrow with typhoon Haiyan/Yolanda destroying much of it November 8, 2014 in one of the most powerful storms measuered on earth. 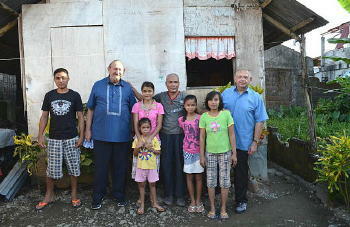 Then we went to visit the Leria's, a new family of six that has started attending the Tacloban church. The father and mother are Nicanor and Nelda. They have four children from the older age 23 Ian to Berna (20), Nike and Nicole. They are a product of the Kingdom of God seminars and have been faithfully attending. 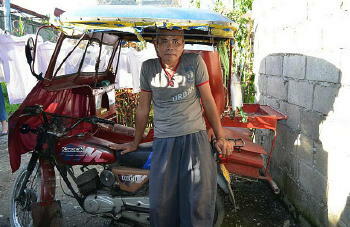 We helped license his taxicle from which he earns a living to support his family. For work he drives a taxicle. 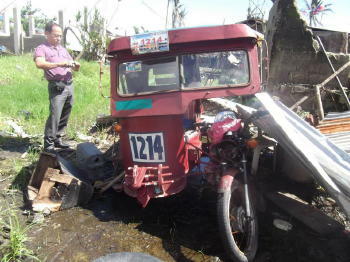 That, along with jeepnie (already mentioned) is a principal means of transportation in the Philippines. It is motorcycle with an outrigger attached that can seat 2 or more people (I have seen 6 people on them). They change 7 pesos per ride (43 pesos to the dollar). In a day he earns about 200 pesos. His wife Nelda had an appendicitis attack and had to be hospitalized. Money that he was going to use for re registering his taxicle was spent on medical expenses. He was fined for not having a licence. He was without the means to make even the meager living he was making. The son Ian is skillful in welding and could get jobs, but does not have the equipment necessary to make a living. The family is very close and lives by strong values, but is poor. These are exactly the kind of people that LifeNets wants to help.....help people get back on their feet so that they can be self-sustaining which they will because they work. I was more than happy to help them with an on the spot grant from LifeNets because I know that they will make it out of the hole that they are in and get back on their feet. The mother Nelda has been providing some income for the family by going from house to house selling laundry soap. Earl Roemer gave them some help, too. Our heart really went out to their family....yours would, too, if you would sit with them in their home and know their story. 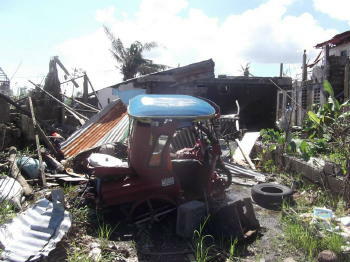 On November 8, 2013, Typhoon Haiyan tore through Tacloban and destroyed everything they had...including the taxicle along with their home. 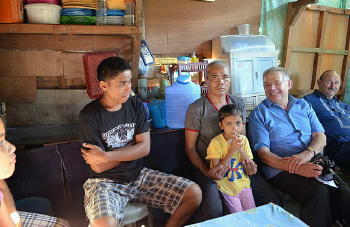 LifeNets will be helping him get back on his feet with a new motorcycle to operate the "taxicle" and will rebuild their home. 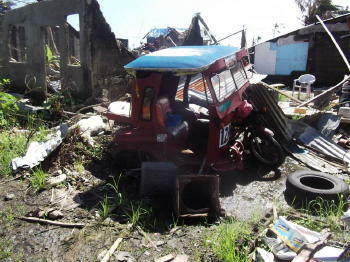 Here are some of the photos of the devastation that took place during Haiyan on their property and their street. "Taxicle" rendered completely useless by the storm surge. Nic and Ian "rode out" the storm here....most of the time swimming and holding on to floating items. 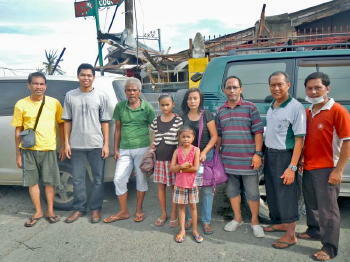 The females of the family were in an evacuation center. 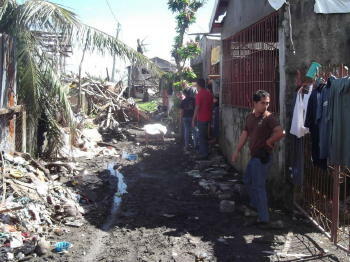 The site of their home after the typhoon. This will be the rebuild site for the Leria family home. It will be built on pilings to put it above the "flood level". Nic and son Ian "rode out" the typhoon here--with waters up to 10 feet deep....with dead bodies swirling around them. They had to swim and float for a few hours before the storm abated. Our disaster relief rebuilding is planning on starting immediately to build a concrete/rebar house on this site.